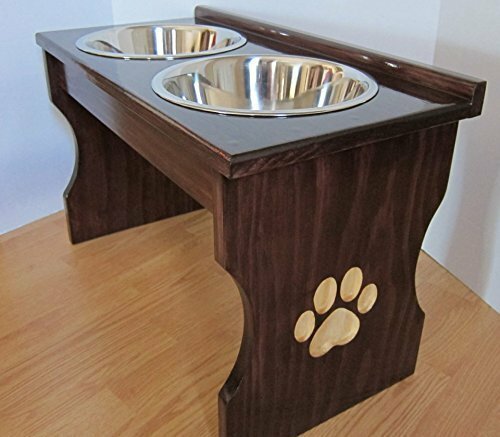 These beautiful all wood construction elevated food dish stations have paw prints carved into the sides of the legs. Solid and sturdy, these food stations keep your pet more comfortable while eating and also keep the food dishes off the floor. The food dish holder can be stained or painted to suit your taste or décor. Two top quality stainless steel bowls are included with each station and are available in the following sizes (see separate listings per size): Size: Bowl Capacity / Size XSmall 16 oz / 2 cups Small 32 oz / 4 cups Medium 64 oz / 8 cups Large 96 oz / 12 cups You can also customize your food station with your pet's name. Be sure to specify the height you need your food station to be (based on your pet's height). Messy pet? Add a crumb catching back ledge for $5.00 more! View More In Feeding & Watering Supplies. If you have any questions about this product by Clever Cat & Crafty Dog, contact us by completing and submitting the form below. If you are looking for a specif part number, please include it with your message.